For the last month I have been preserving our garden produce along with local fruit. I have pickled peppers, frozen pepper spreads, and made chili peach jam and pesto. I feel a bit melancholy as the days get cooler and the abundance of summer quiets down into the fall harvest. Our garden has begun to look tired and somewhat dry. This past weekend I purchased the last of the local Italian plums and pluots from the farmers market. I let them ripen on my kitchen counter until they were soft enough to make this chutney that includes pluots, mostly the Dapple Dandy variety, along with a few Flavor Grenades, Italian purple plums, and Jonagold apples. It is a lovely combination. 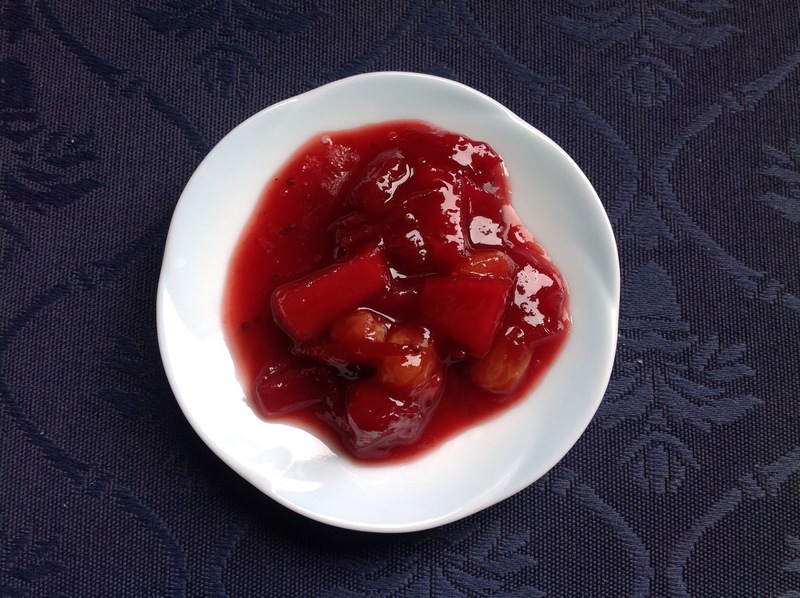 If you cannot get pluots, red plums are still in season. I prefer chutney to be somewhat loose rather than thick. Cook longer if you like it more dense. This chutney is nice with cheese, bread, and meat. You may want to set aside a jar for Thanksgiving. The recipe is adapted from one on Food52. Begin by filling a waterbath canner full of water and bring to a boil. Combine all ingredients for the chutney in a 5-quart stockpot. Mix well. Turn heat to medium high and bring to a boil, stirring occasionally. Lower heat to medium and cook, stirring often until mixture thickens and the apples are fork tender. It should resemble a loose jam. It will take 25-30 minutes to reach this consistency. While the chutney is cooking boil lids and rims in a saucepan filled with water. Sterilize 7 half-pint jars. Fill jars with hot chutney, leaving 1/2 inch of headspace. Wipe rims with a damp paper towel and screw on lids. Waterbath 10 minutes at sea level or 15 minutes at high altitude. Makes 7 half-pint jars. This entry was posted in Appetizers, Fruit, Jams and Jellies, preserving, Thanksgiving. Bookmark the permalink.